This was the first CD reissue of F&T's holiday albums in 1992. It includes the original liner notes and recording dates plus new notes. The disc also includes the "United Artists" logo. 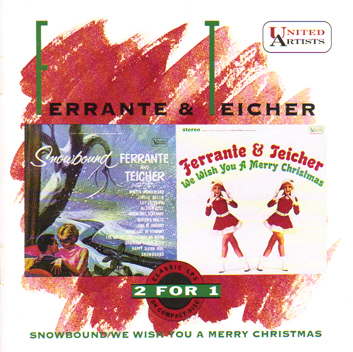 In this charmingly atmospheric collection Ferrante & Teicher, the incomparable piano duo that has defined the state of their art since the late 1940s, are showcased performing a variety of seasonal favorites guaranteed to hold Jack Frost at bay and warm the heart of even the most determined Scrooge. Arthur Ferrante was born on September 7, 1921, in New York City. Louis Teicher was born on August 24, 1924, in Wilkes-Barre, Pennsylvania. Both were child prodigies at the keyboard, and they first met as small children at Manhattan’s famed Juilliard School of Music, where they conducted their entire formal musical education. Upon graduation, both men returned to Juilliard to teach as members of the Theory Department. Following a professional debut as guest artists with the Toledo Symphony, the pair embarked on a full-time schedule of concert work in 1947. After a series of grueling road tours, during which the team drove their own truck and was also responsible for the unloading and assembly of their pianos at each performance, they began to develop a following among devotees of classical music. Ferrante & Teicher recorded for MGM, Columbia, ABC and several smaller labels without major commercial success. Their lives changed forever when arranger-composed Don Costa produced their recording of “Theme From The Apartment” for release as a single on the United Artists label in 1960. This piece of film music was presented in a classical manner, with the artistry of F&T supported by a full studio orchestra, a daring experiment at the time. The single quickly went gold and was followed by their even more successful recording of the theme from “Exodus.” F&T quickly latched on to this format and have never looked back in the course of a career that has produced 22 gold records with total sales approaching sixty million. Their albums usually had a unifying theme, and the two paired here are celebrations of the joys of winter and the holiday season. 1962’s Snowbound was something of a concept album, the aural equivalent of a Currier & Ives print meant to evoke the warmth of good cheer that so many of us associate with the cold days and nights of winters past. It was made at the height of F&T’s first burst of popularity, and it is their only UA album not recorded in New York. Their schedule was so demanding that the recording sessions at Western Sound had to be arranged around a September engagement at the Hollywood Bowl. Arranger Nick Perito penned the title track specifically for this album and it sets the tone for much of what follows, although the choral accompaniment has weathered the decades less effectively than the instrumentation. Particularly memorable are F&T’s playful arrangement of Waldeteufel’s “Les Patineurs (Skaters Waltz)” and “Moonlight Serenade,” not the big band perennial but a lovely melody from the pen of composer Victor Young. Later in their stay with UA, F&T again tried to evoke a seasonal mood through music with an album entitled Springtime. The We Wish You A Merry Christmas album, from 1966, is explicitly about the holiday and all its trappings. F&T adapted and arranged a series of medleys for this recording that encompassed nearly all of the most beloved carols and hymns, and their presentation meshes perfectly with their delightful treatments of modern day classics like “White Christmas” and “Rudolph, The Red-Nosed Reindeer.” This is Xmas music in all its sentimental glory, and if it doesn’t fill the listener with holiday spirit, it might just be time to check him or her for a pulse. Now that you’ve finished with these notes, take this collection and go dashing through the snow to your stereo system. Adjust the volume (taking into account the disruptive potential of the late night sound of hooves pawing on the roof) and strategically position yourself under some mistletoe. Stoke the fire, swig some eggnog, and feel free to gleefully indulge yourself in any clichéd behavior that might have slipped my mind. After all, in the heart of winter ‘tis the season to be jolly, and this music is as helpful with the proper frame of mind today as it was when first released over a quarter of a century ago. What a delightful time of year to reflect on the fact that the good things in life truly are eternal. As wonderful as this CD is, the sound quality was actually improved on future reissues Christmas Is So Special and We Wish You A Merry Christmas & Snowbound.